Just like a hit movie very soon re-hits with a sequel, our rottikallu plan success compeled our director Suhas to organize a quick sequel to a place which is a treasure of adventures and fun. “Dandeli” trip as planned( this time with no postponing at all) for 2nd weekend of 2k11 started from majestic by 8:45PM on Friday. Reaching Rani Chennamma circle , Dandeli by 7:15 AM we located Sandeep, local guide and did payments for our first activity “Fresh Water Rafting”. Suhas tripped around the city with Sandeep to finally locate a home stay Ramya to fresh up. And by 10’ o clock the group of 14 was ready speeding towards the Rafting spot. Tophaan unloaded all of us on the bank of river Kali where there were many other groups like ours. Naushad, rafting guide gave a briefing on his team and the activity. The crowd rushed to pick up life jackets, helmets and paddles of their size and choose on colors as well. Crowd were asked to make small grps with one guide for each n we soon started off with the actual fun. Our guide Naushad explained few the moments of paddles required. To practice the art getting onto the raft in case u fall off, I got into the water to realize that I am damn scared of water and inspite of having on a life jacket I was freaked to the core and without anybody’s notice I tightly clunged to the raft till Radhika pulled me back. 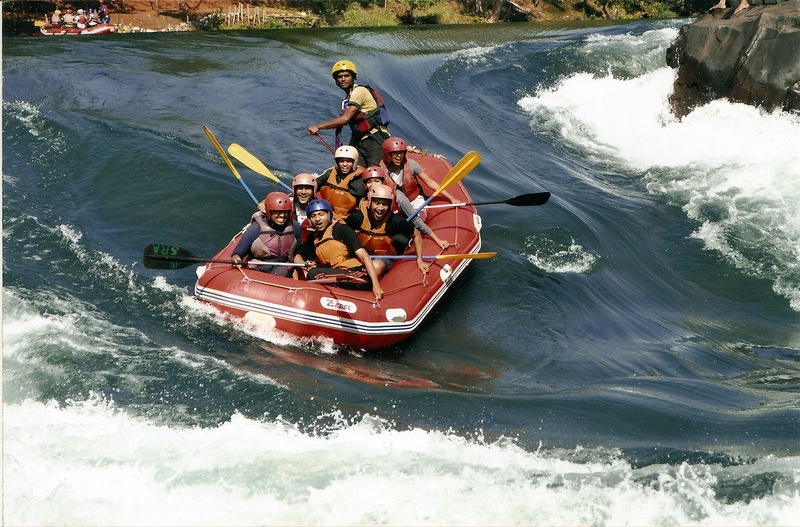 We went through 8 rapids with each one weirdly named (I remember very few “Snikket”, “Leopard hole” hee Radhika experienced this….. ;) ) n each one having its own kinda fun n thrill to relish. Amidst this high energy n equally risky ride the group never forgot to pose to the photographer who waited for us near the first rapid. We screemed on top of voice to express the merriment we were going thru and in no time finished the 9km ride. Of course the other grp had fun rafting several rounds against the course of water and took their sweet time to complete the joy ride. With a lil change in the plan we cancelled out Closed jeep Safari (coz it was “closed” jeep) and decide to reach Kulgi nature camp and relax for the day. We reached by evening and freshed up and loafed around the jungle and strolled to reach the Valley View point a kilometer away from camp. The view was amazing with Sun setting towards ur right throwing lovely shades on the trees and mountains around. We walked few meters into the forest and to my realization its so damn easy to get lost in a jungle like this inspite of keeping ourselves so close to the road. Back in camp, the group played few games n then started its fav game ‘UNO’ followed by a yummy dinner and again few controlled their fagging body to play yet another round of UNO. Next day morning 5am I heard a voice outside my tent calling for director Suhas, it was manoj trying to look for Suhas’s room to inform that there was no water back in any of the tents. Hence instead of 5:30 the venture to Cawla caves got delayed by an hour. Two open jeeps drove into the forest leaving behind clouds of dust. Animals were no-where to be seen except for a deer and few birds. We started trekking towards the cave, along the path made in the forest, few steps to get down and you reach the cave with lot of history n mesmerizing creations n forms of rocks. Scrolling in the dark path you are invited by bats and other nocturnal creatures. Very humid, quiet, calm, ecstasic is the atmosphere there. This was my personal fav. Back in the camp, loaded our hungry stomach with puri-bhajji-chuttney. Round of fresh up and geared up for next activities. We followed our next venture to climb up a manganese mine. The mud left dark prints on our hands which trying to reach the place from where we actually did the rope walk. They asked its 90feet which could be finished in a single or two jumps easily. I came down walking thinking of spending more time with the rope but was later told the jumping was more fun!! Few of us carried back small scratches and marks. Over all a OK activity. I was back near water with an idea to do something which can get the fear of water out of me. Well Kayaking is a lazy man’s cup of coffee unless you forcefully throw yourself in to water n try getting back onto your kayak. Still we had lil fun splashing water at each other with our paddles and tried different postures in which you can row the kayak. @ EOD is still carried the fear of water, which I badly wanna get rid off L Coz it’s a big dream of mine to scuba dive/snorkel and the very water scares me. To Summarise, a great trip by director Suhas and the whole casting group inclding Manoj, Sulakshana, Radhika, ShivaPrasad, Pavan, Pranava, Sanjay, Adarsh, Supriya, Rohit, Jyothi n myself. Great pics, pat ur shoulder for activities well done and cherish the sweet memories. Currently the director & the cast is busy thinking about the next Sequel.